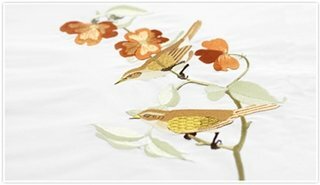 The powerful new 6D™ Embroidery software will inspire you to create exquisite, custom embroideries. Advanced features give you more precision, more capabilities, and more control. 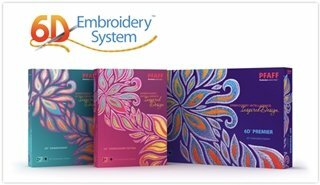 The PFAFF® 6D™ Embroidery System will help you make all your embroideries unique! Change colors of a design to see precisely what it will look like before you stitch it out. Add an elegant monogram to give it the personal touch. With the 6D™ Embroidery System, you can do it all. You can even create your own perfect designs with PFAFF® embroidery software. 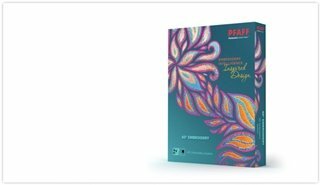 Whether you choose the automatic ExpressDesign Wizard and QuiltBlock Wizard or 6D™ Design Creator, which provides complete control together with a streamlined creation process, your creativity is unlimited. • Create, edit, and display designs in true three-dimensional reality with Life View. Watch Solar Active and Glow in the Dark threads change, and preview designs with special techniques such as Puffy Foam, twin needle and dual threads! 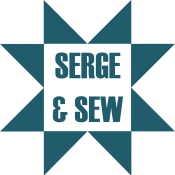 • Design with your choice of over 16,000 threads, even specialty threads, from 33 manufacturers or design multiple personal MyThreads palettes. 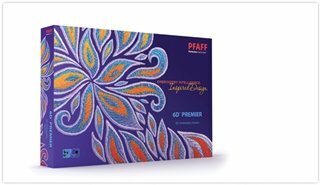 PFAFF® 6D™ PREMIER is the ultimate embroidery software system. It provides unlimited possibilities to design your ideas! • Create complex fonts, or modify fonts produced in the 6D QuickFont Wizard from TrueType® and OpenType® fonts on your computer. • You can even make multi–color and multi–pattern fonts. • Surround your monograms, names or any design with decorative frames and flourishes, or create a border automatically with motifs from your embroidery machine. • Automatically repeat or reflect your designs along 8 straight or wavy lines, around 28 different shapes or to border your hoop with the Encore feature. • Create beautiful designs from your favorite pictures automatically with the ExpressDesign Wizards. • Adjust colors and resize or rotate, even edit stitches. Automatically repeat or reflect your designs along 8 straight or wavy lines, around 28 different shapes or to border your hoop with the Encore feature. • Visualize your personalized project on a real-life background including appliqués before splitting it automatically for your preferred hoop. *Color effects available in 6D™ Premier only. 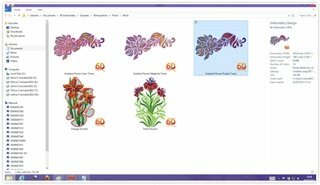 • Reshape and restyle your embroideries with object editing features. Convert the selected area(s) to different fill or satin types, specialty fills and so on. • Add cutwork needle lines, color changes, stops and trims: add Trim commands automatically or individually. 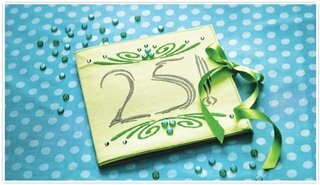 • Use the exclusive Emboss features to add beautiful patterns. • Use system stamps or create your own! Personalize your embroideries with embossed text from your computer fonts. • Transform your design with the 12 fantastic point and global morphing effects. • Frame them with beautiful borders, even with appliqué. *Compatible with HUSQVARNA VIKING® DESIGNER™ MAJESTIC, PFAFF® creative™ GRAND DREAM or Brother Jumbo and Janome Giga hoops. All these features are also included in the PFAFF® 6D™ Premier software package. 6D™ CROSS STITCHER is available from the Internet Purchase Center as an add-on to the PFAFF® 6D™ Embroidery System. Either 6D™ Embroidery or 6D™ Embroidery Extra is required before purchasing add-ons from the Internet Purchase Center.